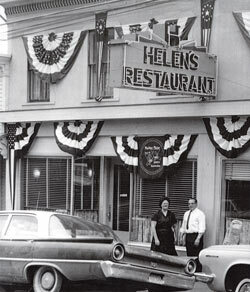 Helen's Restaurant opened for business on Main Street, Machias in 1950. Helen and Larry Mugnai along with Larry's brother Julie and sister Esther ran the restaurant, building the reputation of great homemade food. 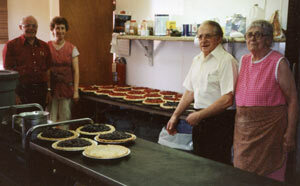 And no one who had one could ever forget those pies! In 1976 a customer who often teased Larry about selling Helen's was surprised one day when Larry said he was ready to sell. Bob and Joan Carter purchased Helen's with Larry staying on board to help during the transition. With crowds waiting up the street for a seat and poor parking on Main Street, the Carters decided to move Helen's to its present location in 1983. The Carters built the Machias Motor Inn next door in 1988 and sold the restaurant to Joan's sister Judy and her husband Gary Hanscom (with Larry still in the bakery). With encouragement and help from Mugnai the Hanscoms opened Helen's of Ellsworth in 1994. Larry Mugnai then retired from Helen's after 44 years. 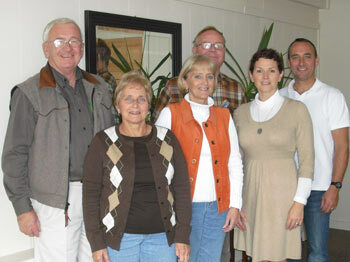 Judy and Gary sold the Ellsworth location and decided to retire selling to son David and his wife Julie in 2008. We (David and Julie) first worked for the Carters on Main Street at the original Helen's location in 1981 and then to the present site before marrying and moving to the Netherlands in 1986 with the Air Force. Working alongside Judy, Gary, Joan, Bobby, Larry, Julie, and Esther (and all the other great Helen's workers) are treasured memories. Upon our return to Machias, Julie went back to Helen's as a waitress and private caterer and David as Helen's manager. In 2005 we purchased the Schoppee Dairy and opened The Inn at Schoppee Farm. Buying great fresh seasonal food from local farmers (organic when possible) is an ongoing mission we are committed to. This mission has influenced the way we run Helen's. We compost all of our food waste; recycle our plastic, aluminum, and cardboard. Most cleaning products are plant-based, we use recycled paper products, and all Styrofoam has been eliminated. Great food is absolutely what we are all about; we LOVE food and are constantly searching and improving our menu as well as preserving the Helen's classics. We hope you enjoy the changes and your Helen's experience. With our daughter Rianne as manager, we strive to continue Helen's reputation of serving outstanding fresh local food at an affordable price with great service. We value your business and welcome any comments or suggestions.